Margie’s mom taught her to bake, and to believe in Christmas magic. She also promised this would be the year Margie found love. 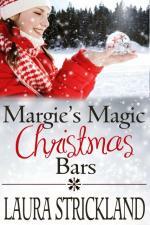 When Margie draws the name of her office crush, Trent in the Secret Santa Pool, she decides to make it happen by baking him a batch of her irresistible Magic Christmas bars. But it’s Bryan, the new guy in the office, who falls under her spell. Bryan doesn’t need any encouragement when it comes to Margie. From his first day on the job, he’s been captivated by her sweet nature and beautiful smile. Bryan can tell Margie only has eyes for Trent, but he recognizes Trent for what he is, a charming user likely to break Margie’s heart. Before that happens, he must make Margie see she’s closer to her Christmas miracle than she ever dreamed. View more books in the genre "Christmas Romance". View more books in the genre "Collection".